The last month of our lives have been rather crazy, and a lot of that craziness is surrounding my sweet Georgie Bea. In late January I finally took in Georgie for an overdue two month checkup. I was excited to see how much she had grown! She seemed like such a tiny thing, I was curious to see her percentages. Nevertheless I was still surprised to learn that she had only gained 11 ounces since her two week checkup. In case you are not familiar with the weight gain curves that doctors use, that is not so good! 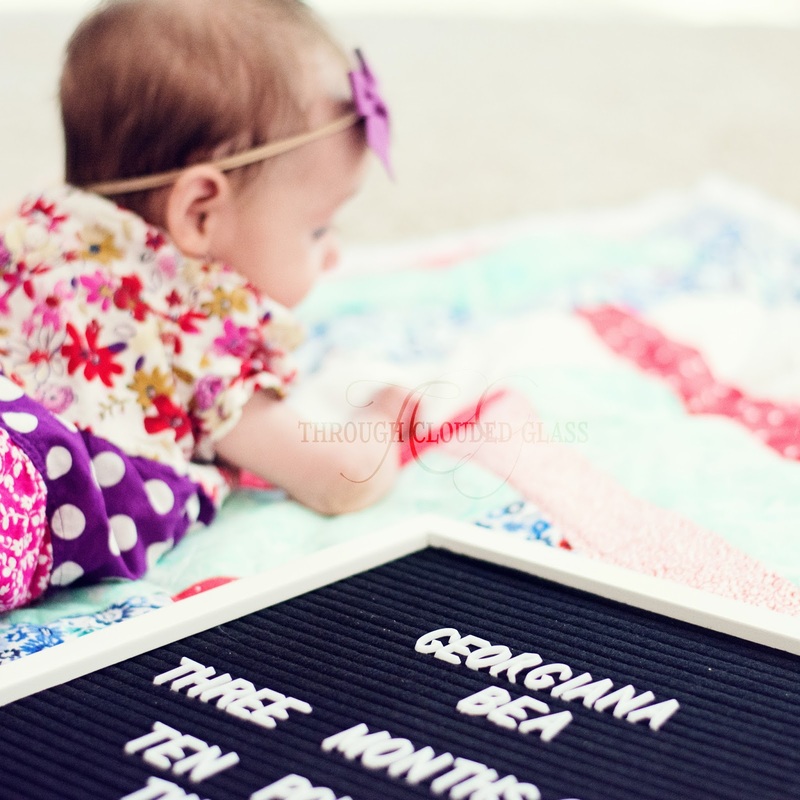 She had dropped completely off the chart, below the first percentile. 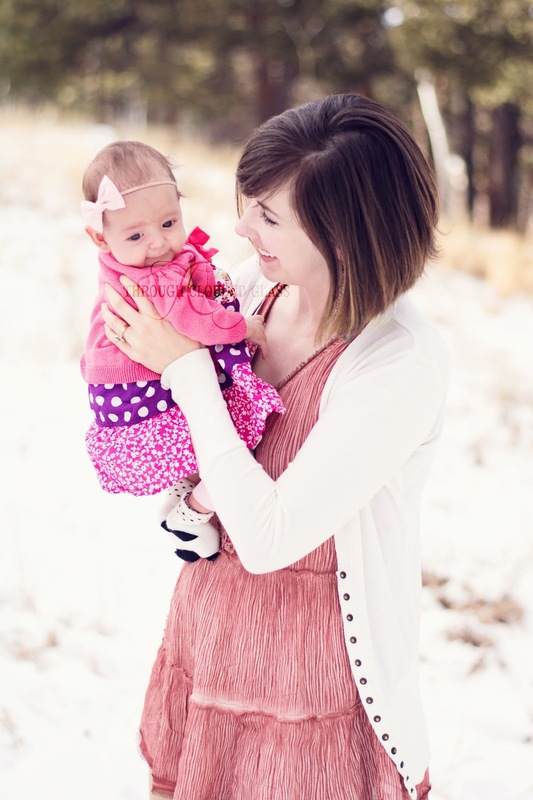 In the week leading up to our appointment I noticed she still seemed so tiny and delicate, but she seemed healthy and content, and she was hitting all of her milestones. I honestly didn't realize she hadn't been gaining weight. I still feel a little guilty about this. Enter "Operation: Fatten Up Georgie". For the next week I fed her every two hours and topped her off with formula at least twice a day. Whatever I did seemed to work, and a week later when we went in for a weight check she was up to 10 pounds, 2 ounces at 3 months old! She's still tiny, but her weight is moving in the right direction, so that's good. 1. Georgie sleeps about 12 hours at night. This is completely amazing for obvious reasons, but it was not helping her in the weight gain department. 2. Because she sleeps so long at night, my supply had been dwindling. However, this was so gradual that I didn't notice it until the last couple weeks when it became a problem. 3. My milk wasn't letting down properly. I have five kids, and it's hard to find a quiet time to feed Georgie where we won't be interrupted. I think this was making it hard for me to relax enough for my milk to letdown, which contributed to my supply issues. 4. On a normal day, Georgie is an extremely content baby, and she just wasn't letting me know when she was hungry. I was feeding her at three hour intervals or so, but she needs more than that right now. We now officially have her on a timer. We'll have another weight check in the next couple weeks, but I am very confident that she is gaining weight happily now. Her face has gotten notably rounder, and she even has a double chin. She's even chubbed up since her three month pictures that I recently shared on Instagram! Unfortunately my supply continues to dwindle, and I just don't have time or motivation to add pumping into an already packed day, so we've been giving her 2-3 bottles of formula each day. We didn't make it as long as I wanted to with exclusively nursing this time, but c'est la vie. I'll just be happy if we can at least partially nurse until six months at this point. As you can imagine, it's hard to keep up on things when you have five kids to take care of and one of them needs to be fed every two hours, hence why this post is late. 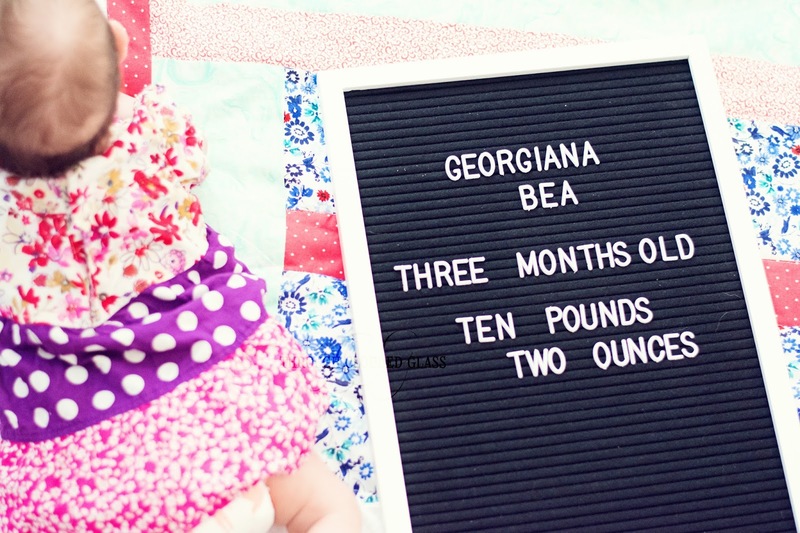 Aside from her weight, Georgie has been changing and growing in so many ways this month! As I mentioned, Miss Georgie is an amazing sleeper! She goes 12 hours at night, and I intend to enjoy this as much as possible. I'm fairly confident she will stop sleeping through the night around four months because all of my babies have gone through a growth spurt at four months. She also takes one afternoon nap during the day (having only one daytime nap is my tradeoff for a full night's sleep - I'll take it!). The day we found out Georgie wasn't gaining weight (January 25th), she laughed at me. I can't tell you how comforting that was to me - right when I was beating myself up for not realizing she wasn't growing on track, she blessed me with sweet baby giggles. It's a cute little belly-chuckle sound. She's mostly just laughed for me so far (and once for Derek), when I tickle her tummy. I got the best video of her laughing at me repeatedly for a minute straight, and I rewatch it sometimes when I need a grin. I just love her laugh so much! She also discovered her hands. One day I had her laying on the bed in my room while I got ready to go somewhere, and I looked over at her and she was just starting so intently at her hands. I always find this phase so funny! It's so cute to watch her little quizzical expression as she tries to figure things out. We also celebrated our first New Year's with Georgie, and went to the stock show together for the first time as a family of 7. She still rolls over both ways, but only occasionally. However, she's such a strong little thing! 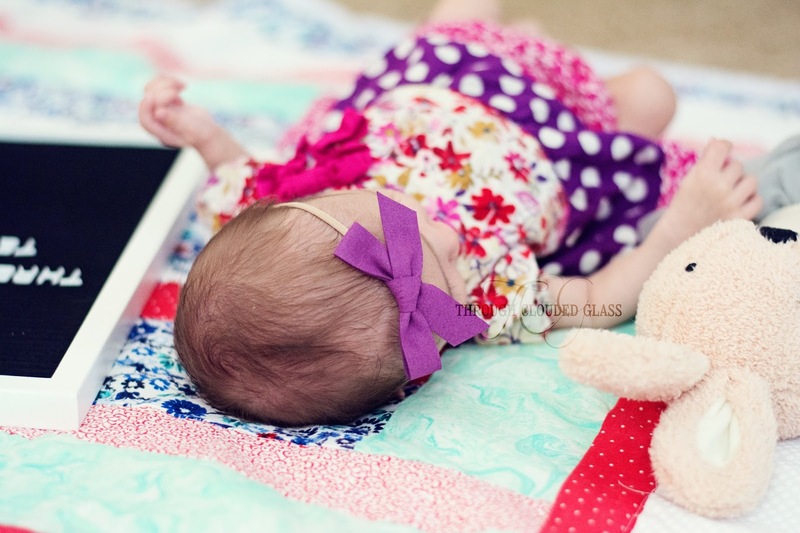 Her head support is pretty good for her age, and she pushes up with her arms really well when we do tummy time. As I said, Georgie is mostly a very content baby, though since we've been feeding her every two hours she has gotten a little more vocal. I think she finally realized she likes to eat. She has the sweetest little grin, and she smiles much more quickly now than she did a month ago. Her dimples are just the best thing ever! I can also tell she's getting a little more attached to me - When someone else is holding her she will just stare at me and follow me around with her eyes. She doesn't talk too often, but when she does it's the cutest little cooing/sighing sound. If you want to hear her talk you have to stare right into her eyes and talk to her, and then she'll wait for a break in the conversation to coo back at you. You threw me for a loop this month! I can't believe how tiny you are, but your sweet little grins and baby talk reassure me always that you are doing just fine. You are such a happy baby! Your grins light up my whole day, and I'm a tiny bit obsessed with your dimples. I sit with you sometimes and just try to get you to smile over and over so I can catch a glimpse of them. And don't even get me started on your laugh. Your baby giggle puts both your dad and me in stitches - we just can't help but laugh along with you! What a sweet little joy you are. I can't imagine our life or family without you, my little lady. You live up to your name. I’m so sorry you had to go through all that stress!! You’re doing such a good job. So adorable! She seems healthy despite being petite! I had something similar happen. We don't even do many of the well check-ups throughout the year for various reasons. My daughter also was sleeping 12 hours a night from about 2-4 months. And she just wasn't a huge nurser. But she was over 8 lbs at birth and gained great initially. She was outgrowing her clothes, so I assumed she was growing well. So we finally went for a check-up when she was around 9 months (I know, we're bad parents) and she was on the small side for her age. I always tell myself that I'm nursing on demand and it's just genes, but a part of me was scared that I'd missed an opportunity to feed her better. I actually had oversupply, which I thought was good...but maybe it put her off feeding more than she would have. I'll never know! I bet Georgie will be just fine. My daughter has always been very feisty and physically active, so I bet some babies just burn more calories, too. I am so sorry you had to go through all of that, Callie. I am happy to hear that your precious girl is happily growing and making strides. 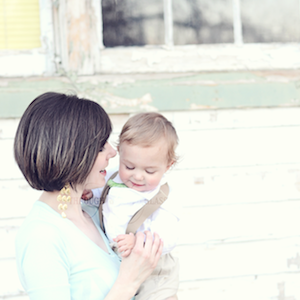 You are such an amazing momma to all five of your little ones. I don't know how you do it all so well!